Key lime cooler cookies, made with heaps of lime zest and stored in the fridge. The best summertime cookies! I’m a citrus girl, through and through. It’s pretty great to be me, actually. I can breeze right past a display case of fancy chocolates and order the humble lemon tart. I can pass up a triple chocolate something-or-other in favor of a lemon pâte de fruit. And when it comes to cookies, I like a small batch chocolate chip cookie as much as the next girl, but the cookies that keep me coming back, stealing one after another all afternoon long? 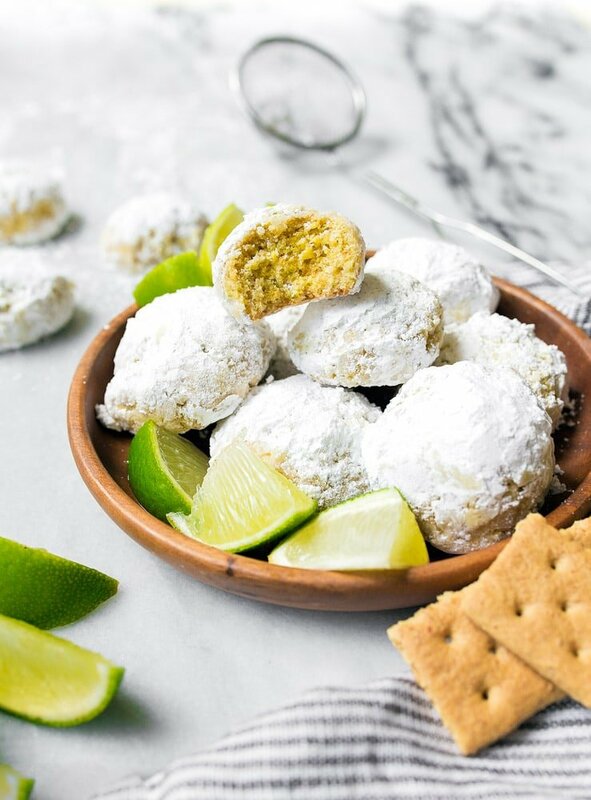 KEY LIME COOLER COOKIES. 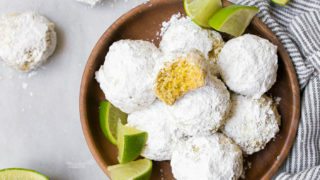 These ‘coolers’ are sometimes called snowball cookies or Russian tea cakes (and I made pistachio lime matcha snowball cookies once before). I’ve also heard them called polvorones or Mexican wedding cookies. I call them delicious. And addicting. They’re basically crisp little cookies covered in powdered sugar. They melt in your mouth. And the punch of key lime is exactly what I need in the summertime. I actually keep these cookies covered in the fridge, because there’s nothing like a cold little cookie on a hot day. But I have even better news than a cold cookie on a hot day! You guys know of my love for Kerrygold butter. It’s rich, creamy, and Irish. It’s a game changer when it comes to baking. I’ve been working with Kerrygold since the year this blog started (2010–yikes! ), and I have faithfully dealt with their half-pound butter bricks. Anytime I would bake, I would just pull out my scale and measure the butter by weight. It worked just fine, but I silently plead for a butter stick that I could slice a little easier. 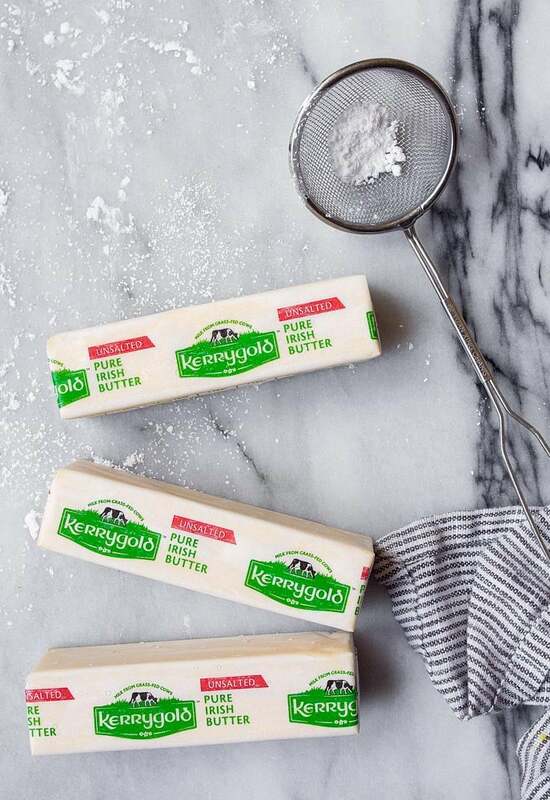 And then Kerrygold answered my buttery prayers: they started making butter sticks just for baking! I couldn’t believe my eyes when I saw them. I feel like they personally made the sticks for me–like they knew of my kitchen cries, the poor wrapping job I would do on my remaining butter brick, and my kitchen scale covered in butter. Kerrygold just gets me. Like a cold cookie on a hot day. It’s true love. In stick form! Key lime cookies, small batch makes 1 dozen cookies. Preheat the oven to 350, and line a small baking sheet with parchment paper. Crush the graham crackers to get 1/4 cup of crumbs, and set aside. In a small bowl, beat together with an electric mixer the sugar and Key lime zest for about 30 seconds. Next, slice the cold butter into about 16 pieces, and then add it to the bowl. Beat the butter into the sugar until creamy and fluffy, about 45 seconds. Add the egg and beat just until combined. Next, sprinkle the flour, graham crumbs, and salt evenly over the surface, and beat until just combined. The dough will be crumbly, use the warmth of your hands to bring it together. Have the powdered sugar ready in a shallow dish. Bake for 15 minutes; the cookies will not turn brown. Do not over bake. 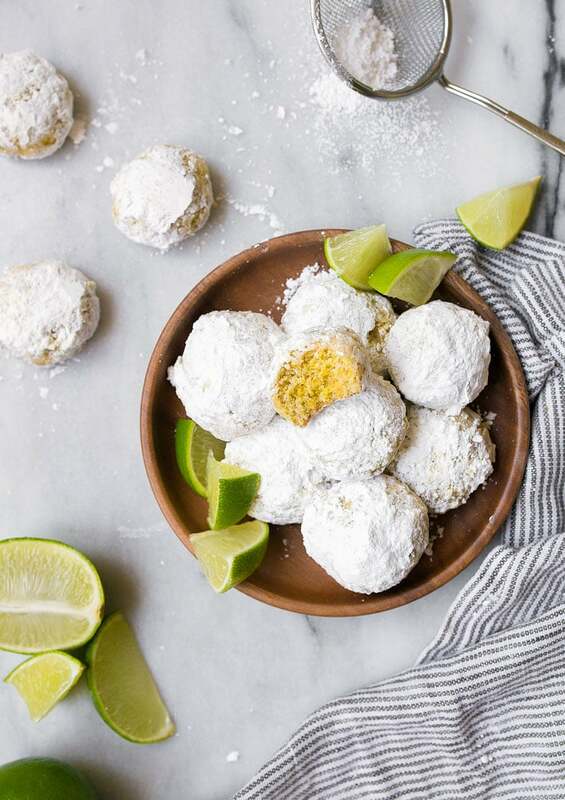 While the cookies are still warm, roll them each in powdered sugar again. I’m with you – cookies from the fridge are so much better in the summer! Can’t wait try these out! I’m not sure I see where the crushed graham crackers come in? But these sound delicious! I’m with Rebecca…is the graham “flour” added with the AP flour? Yes, I fixed the recipe, sorry. UM, can you say YUM? These are perfect for summer, adding them to my must make list. Oh yes, anything lime!! I’ll definitely be trying this one.???? What size cookie scoop do you use for these? Also how long do they last? It’s just a small scoop…it holds about 2 teaspoons of dough. I would try to eat them in less than 2 days, but they never last that long. Thank you. I’m making them now and they flattened some. Any ideas what I should do differently next time? I live in Phoenix if that helps. How do I avoid flattening of the cookies? I tried them out, the taste was amazing but not the shape.